Beachcombers Henna Help Site Relax! Henna is Fun! New To Henna? Click Here! Many people are looking a for a deep black tattoo-like stain from natural henna. Natural henna does not leave a black stain. The color of natural henna varies and can be a deep burgundy brown, coffee brown, rich maroonish, or any shade of orange or brown, such as the picture to the right. The color of your actual henna tattoo will depend on a number of factors including, how fresh the henna is and what it is mixed with, how the skin was prepared before applying the henna, how long the moist henna was in contact with the skin, what part of the body was hennaed, and how the dried henna was removed. Natural henna is safe. I've been doing henna since 1999 and I've never encountered an allergy to natural henna. It's important that you only use natural henna and you know what other ingredients are mixed with the henna. Any "henna" that leaves a deep black stain that lasts for more than a couple of days, contains dangerous chemicals and may not contain henna at all. "Black henna" containing chemicals IS dangerous. Especially if you’ve had a black henna tattoo in the past. The picture below is from a MSNBC article on black henna. Having never used unsafe henna, I have no pictures of my own to show you. 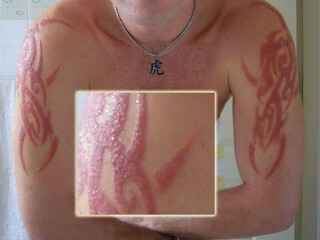 Do a Google Images search for Black Henna Scars if you'd like to see more of what can happen to you. Why? So-called black henna contains a toxin called para-phenylenediamine or PPD (coal tar) and benzene (yes, the same benzene that is found in gasoline and paint solvents) which seep into your bloodstream. Imagine mixing gasoline, black dye, and coal tar and applying it to your skin and you have black "henna". Sounds great, right? Para-phenylenediamine (coal tar) is most often found in hair dyes. It is legal in hair dye in the USA at 6% or less. It is illegal in many European countries. When it used as "henna," it is typically in concentrations of 30-70% or more. Think about that. With hair dye, it's not seeping directly into your skin for an hour and it's only at 6% or less! The allergic reaction that PPD can cause is similar that of an allergy to bee stings. You may know someone who has to carry around a life-saving syringe in case they are stung by a bee? A PPD allergy can develop at any time once you are sensitized to para-phenylenediamine, but may not show up for weeks, months, or even years. Every time you come into contact with PPD, the allergy will worsen. You will be sensitized to PPD for the rest of your life. Once sensitized to PPD you will be cross sensitized to many other chemicals. Once sensitized to PPD you will never be able to dye your hair again. A reaction to para-phenylenediamine can include itching, a rash, full body hives, severe blistering, severe swelling, permanent scarring, liver damage, and life-threatening breathing problems. Progressive exposure to PPD and benzene has been linked to leukemia and other blood cancers. "Severe overexposure may cause facial, pharyngeal, and occasionally, laryngeal edema. Death may be rapid due to acute respiratory distress." Read about this study from the Internal Journal of Environmental Research and Publix Health from the UAE about PPD and black henna. If you have had a black henna tattoo, do NOT dye your hair with a synthetic hair dye without getting checked for an allergy to PPD. To learn more about how seriously this sensitivity can effect your daily life, read this short article by Perry Jackson and her experience of living with an allergy to PPD, that was acquired from hair dye. This is serious. Using "black henna" could cause you to up with a life-long allergy, cuase an immense amount of pain, lifelong scars, and/or liver damage. Opt for safe natural brown henna instead. PPD is a common additive for hair dyes. PPD is only approved in the USA for use on hair if less than 6%. seeps directly into the bloodstream. Sweden, & Germany for use in, even, hair dye. Benzene is sometimes mixed into regular brown/red henna. Henna mixed with benzene, kerosene, or gasoline, will have a chemical smell (that may be masked with essential oils), may feel like it is burning the skin (because it is), and will leave very quick, dark color. Make sure the henna about to be applied to you smells earthy and the artist tells you that the henna should stay on as long as possible. harsh solvents, and other petroleum products. Dubai has banned benzene and PPD as henna additives because of a high rate of Leukemia among women from exposure to adulterated henna. These are pictures of a customer who was exposed to henna mixed with benzene, kerosene, or gasoline while at a tourist spot in Georgia. This henna tattoo was done TEN MONTHS before these pictures were taken. She said the henna had a painful burning sensation while it was on the skin. It left a nice deep brown color though it was only left on for less than an hour. Henna should not burn. It may feel a little itchy on the skin as it dries since it is shrinking, and it may make your skin feel cold, but it will NOT burn. Henna should have a natural scent and you will likely smell the essential oils mixed in the henna. ~ It should NOT smell like chemicals. ~ It should NOT burn. ~ Any artist worth getting henna from, WILL be able to tell you the ingredients in their henna paste. There aren't as may warnings or pictures of damage from henna with additives like benzene, kerosene, and gasoline as there are for black henna. The real danger with these additives is that they are carcinogens (cancer causing and cancer spreading agents), and they build up in your blood stream and liver. They don't just go away when your henna tattoo goes away. The fact that they can leave a color similar to natural henna is tricky. Look for tip-offs such as only needing to leave the henna on for a short period of time, really long lasting henna, or an artist being vague about the ingredients in their henna. ONLY use safe natural henna! How do you know if henna is safe for use? What color will my henna tattoo be and how long will it last? If the answer is black and more than 3 days, the henna contains PPD. Do NOT allow that henna to be applied to you or someone you care about. Natural henna will start off an orange and cure over a couple of days to be a brown or red brown color. May I see a list of ingredients in your henna? Check for any chemicals or any other ingredients that you may trigger an allergy. Mixing henna is not a secret. Any good henna artist will be willing to tell you what is in their henna paste. If ANYTHING in the ingredients ends in "z/sene" avoid it. How long will the henna need to stay on my skin? Natural henna needs time to produce good long-lasting color. If the answer is less than a couple of hours, there is likely something else mixed in with their henna. Use you instincts. If something feels off to you, don't get henna from that person. In addition, look at the henna paste. While wet it should be a green or brownish, it should not be black or blue black. Smell the henna paste. It should not smell like chemicals. It should smell natural and with whatever essential oils the henna artist used in the henna paste. Avoid henna with any chemicals added. Avoid henna without listed ingredients. Avoid any "black henna" that lasts more than a day or two or is jet black. Only henna children over 8 years old. Do not henna children with hyperbilerubenimia. Avoid doing henna on adults with G6PD. Review your henna ingredients with every client. If doing henna on sensitive clients use mild ingredients and oils, such as lavender oil. The paste appears black, especially in pictures, but it's actually somewhere between a green and dark brown. as the paste dries, it darkens to appear black. Henna will start off orange and darken over a couple of days. 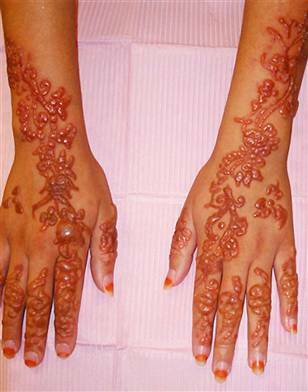 There are a couple of disorders that can make henna dangerous for children or adults: Hyperbilirubinemia and G6PD. In cultures where henna is done often, children are screened at birth for these disorders, but here in the US, we are not. Hyperbilirubinemia can cause severe anemic reactions in children exposed to henna. The younger the child, the more severe the reaction. If a baby was jaundiced at any time, do not henna them. G6PD is a disorder that can potentially cause issues in adults that get henna. For small amounts of henna, exposure is not normally an issue, very large amounts such as wedding henna can cause problems. Other items people with G6PD are often sensitive to are aspirin, fava beans, and mothballs. Most reputable henna artists avoid doing henna on kids under 6. I don't henna children under the age of 8. My daughter has severe allergies to many cosmetics, and that makes me a bit more conservative than most. She has had henna tattoos since she was 8. Read this medical article for more information on Hyperbilirubinemia: Henna Induced Severe Hemolysis. Here is a more user friendly site about G6PD. If you henna children, pregnant women, or other sensitive individuals, consider making your henna mixture as mild as possible. Avoid harsh oils in your henna mix. If you use oil, I suggest lavender oil, as it is very mild. I normally use an equal mix of lavender and tea tree oils. Have a complete list of your henna ingredients ready and review these ingredients with every client. Most reactions to henna, are not a reaction to the henna itself, but to an ingredient in the henna mixture. Visit us at our henna studio! pictures, text, and PDF files. All rights reserved worldwide under the international Berne Convention and the US Copyright Act of 1976. To request permission of use contact ShopBeachcombers.com, Inc.